Make the pickled vegetables a day ahead. Combine the fish sauce, vinegar, sugar and 250 ml water in a saucepan and bring to the boil. Remove from the heat and allow to cool to room temperature. Transfer the mixture to an airtight container and add the papaya, carrot and chilli. Mix well, seal and leave to pickle overnight, or for 24 hours. The beef can also be marinated well ahead. Combine the fish sauce, palm sugar, annatto oil and kreoung paste in a mixing bowl with a pinch of sea salt. Stir until the salt has dissolved, then add the beef and mix until well coated. Cover and leave to marinate in the refrigerator for up to 24 hours, but at least 2 hours. When you’re nearly ready to cook, soak eight bamboo skewers in cold water for 30 minutes. Heat a barbecue char grill or char grill pan to medium. Thread the beef onto the skewers and chargrill for 2–3 minutes on each side, or until cooked to your liking. Slice the baguettes lengthways halfway through, creating a pocket. Fill each one with some pickled vegetables and two beef skewers. Pull the skewers out of the rolls and serve. NOTE: Annatto seeds, also called achiote, add a golden colour to foods such as pork, chicken or rice. Annatto seeds and oil are sold in Asian and Indian food markets. If you can only find the seeds, you can use these to make annatto oil. Heat 1 tablespoon annatto seeds in a saucepan over low heat with 125 ml vegetable oil. Heat just until the oil begins to shimmer; don’t overheat or the seeds will turn black. Remove from the heat and set aside to cool, then strain the oil into a jar. It will keep for several weeks in a cool, dark place. Kroeung paste is an essential base for many Cambodian dishes. Use a large mortar and pestle or a food processor to pound or process the following to a smooth paste: 3 tablespoons peeled, sliced fresh galangal; 3 tablespoons peeled, sliced fresh turmeric; 6 sliced garlic cloves; 2 finely sliced lemongrass stems, white part only; 2 sliced red Asian shallots; 10 finely shredded kaffir lime leaves; 6 sliced bird’s eye chillies; 2 sliced long red chillies; 1 teaspoon black peppercorns; 1 teaspoon sea salt; 1 teaspoon shrimp paste and 60 ml vegetable oil. You can refrigerate the spice paste in a clean screw-top jar for up to 2 weeks. 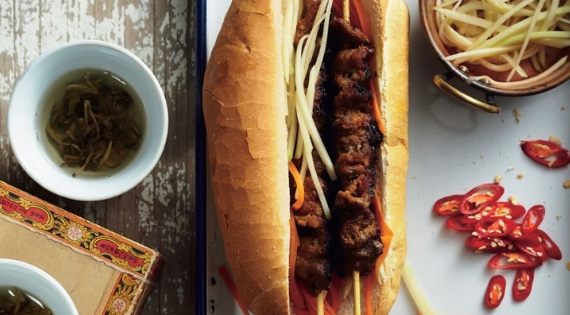 Recipe from Luke’s Book - From China to Vietnam: A Journey Down the Mekong River. Click here to purchase the book now.